Things to do in Myrtle Beach this Summer! Summer is in full swing on the Grand Strand, as smiling faces cover up the golden shorelines of Myrtle Beach! There are so many things to do in Myrtle Beach this summer. Although the beach is the number one destination during most vacations to our area, there are a myriad of weekly activities and special events all summer long! Let’s take a look at current and upcoming events to the North Myrtle Beach and Myrtle Beach area! This week! July 12th – 17th: The youth help celebrate the history of our State Dance, The Shag, with Junior SOS Week! All week long, Main Street in North Myrtle Beach has been electric with energy. Whether you are a dancer or not, you will surely enjoy a taste of South Carolina history! Enjoy free concerts on the Main Street beachfront every Thursday! Bring your beach chair and enjoy a night of music; all ages welcome! Myrtle Beach: Downtown Hot Summer Nights! 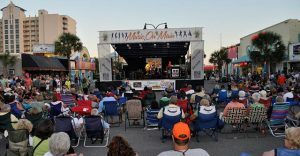 In Downtown Myrtle Beach, enjoy events held nightly through August 22nd! 15th Annual Mustang Week: July 18th – 24th: Prepare to experience a sea of modified customs and restored classics during the 15th Annual Mustang Week in Myrtle Beach! Rallies and meets will pop up all over the beach next week, but head over to Myrtle Beach Mall to witness one of the largest gatherings of Mustangs in the country! We have sun, sand, and much more this summer in Myrtle Beach! There is still time to book your premium beach vacation, view our luxurious inventory and reserve your trip to join in on all the fun!